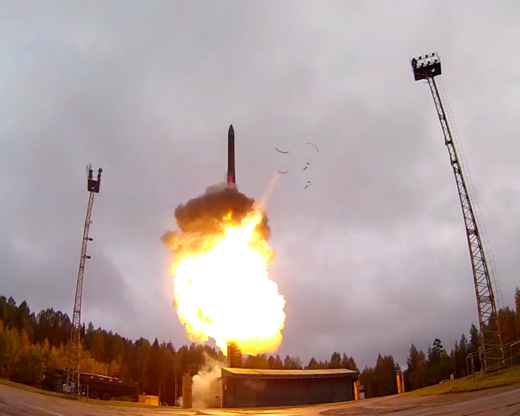 On September 20, 2017 crews of the Yoshkar-Ola missile division conducted a successful training launch of a mobile RS-24 Yars ICBM from the Plesetsk test site. The ministry of defense reported that all warheads successfully reached their targets at the Kura test range in Kamchatka. The goal of the launch was described as "confirmation of reliability of a party of ICBMs of this type." Russia has been conducting an annual large-scale exercise of its strategic forces in October (here is the most recent one), but this one appears to be linked to the large Zapad-2017 exercise that was completed today. It is worth noting that before the launch the missile crews practiced "relocation of the missile launcher to a remote launch area." Previous launch of a mobile Yars missile was conducted quite a while ago - in December 2014. The last time the Yars missile was tested from a silo was a bit over a week ago - on September 12, 2017. UPDATE: The missile was launched from a Krona stationary shelter. This can be seen on the video of the launch posted at the ministry of defense site (for example, at 00:17).